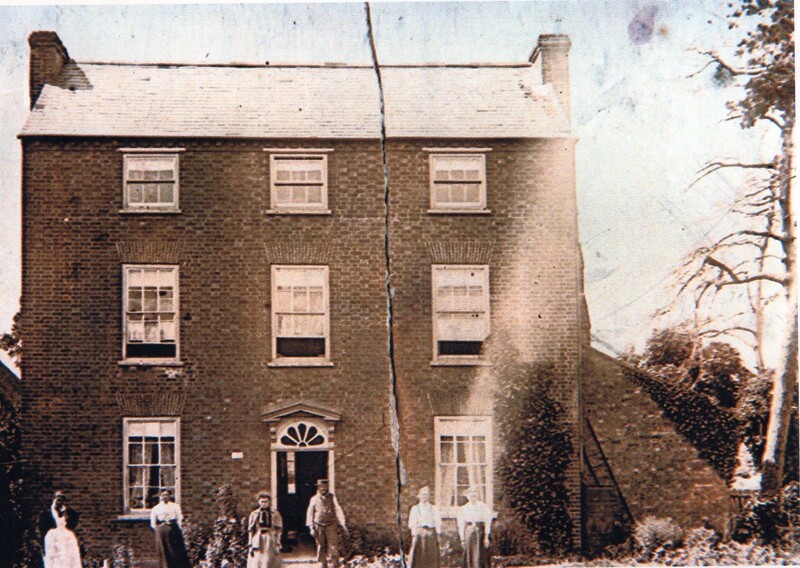 Mrs. Heming, widow of John Heming who died in 1713 is believed to have lived at The Firs Farmhouse. Her daughter Elizabeth married Thomas Bomford of Wyre Piddle. Heming Bomford, son of Thomas and Elizabeth, was born in 1739. He married Elizabeth Chellingworth in 1769 and they lived at The Firs. The fir trees were purchased from the Ragley Estate and planted where they were supposed to indicate a refuge for Puritans. 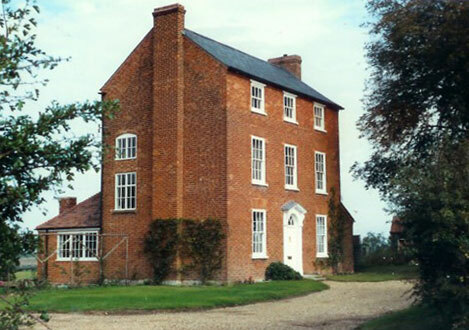 In 1779 Heming Bomford occupied the whole of the Manor at Atch Lench. Of his five sons Benjamin in 1813 took over his parents home at The Firs (he was the father of Benjamin of Pitchill). Joseph, another son, went to Sherrifs Lench; John was at Westmancote; Heming at Sambourne with the Chellingworths and Thomas at Court Farm. Heming left a small house for use as a Manse and he lived in this house during his last years. The Firs was probably not occupied by Bomfords after 1854 when Benjamin the elder died. Built in 1810, probably on the site of the old Manor House. (Christopher Bomford who lived there said the cellar was made of old stone, while brick was used for the later house). Joseph Bomford the elder lived in this house and was followed by George Frederick Bomford (Chris’ grandfather). Then his aunts, Margaret and Frances, were in residence. Christopher and Lilli lived there from 1946-1962. Chris also occupied the farm of 500 acres for 20 years, from 1942. This house is situated down the road towards Church Lench. Thomas Bomford, b 1781, m Sarah Pearce, lived at this house. At one time Chris believes there were several houses later joined into one. The houses passed to Thomas’ children. 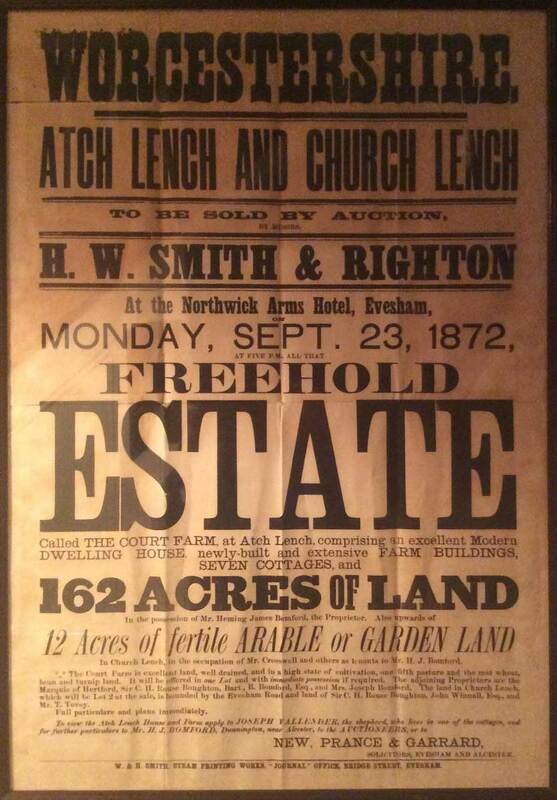 But in 1872 John Heming Bomford, b 1845 and not a descendent of Thomas, offered it for sale - see poster above. Notwithstanding, the house seems to have remained in Bomford hands. Two sisters, John Hemming's nieces, Emily and Lucy Bomford, ran a school at the house 1870-1918. Two brothers, John (John Hemming Bomford above) and William, also lived there at one time. 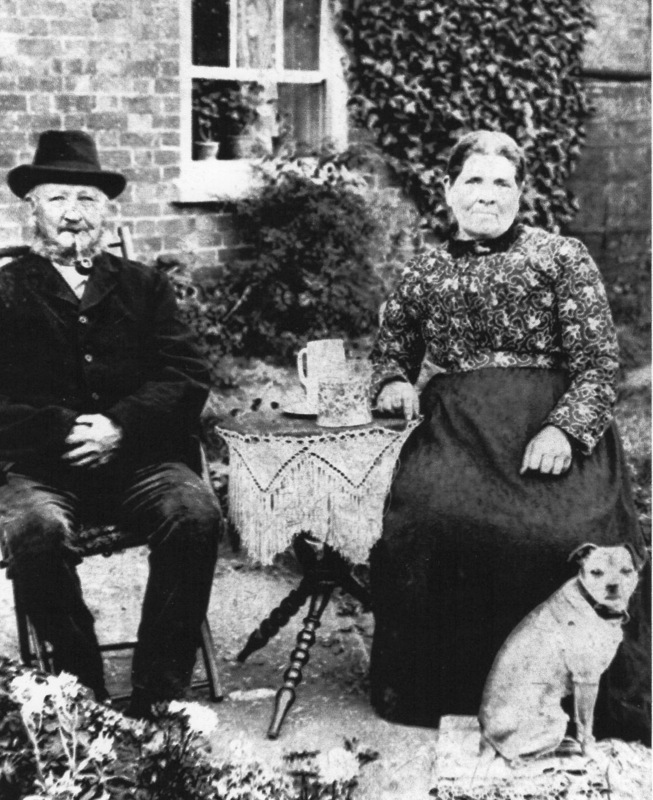 John managed the farm, while William was a partner in an engineering firm at Alcester. (Chris has a medallion presented to Bomford Bros. and Co. at Staffordshire Agricultural Show in 1889 for a draught excluder). Their brother, Edgar, was also possibly in the firm. The house was sub-let in 1931/32. There were big aspen type poplar trees near this house when Chris was a boy. Joseph Bomford 1811-1861, married Mary Hughes 1815-1880, and they lived in this house after they married in 1834, until 1861. Later the house was owned by the Duke of Orleans of Woodnorton. Joseph Comely Bomford married Mary Fowler in 1908 and they lived in this house. It was rented from Mr. Chafey from 1906-1919 and afterwards purchased by the Bomford family. Previous owners included a Mr. Stokes in the 18th century, a Mr. Postin was later a tenant, as was Mr. Benjamin Smithin in 1848. In 1833 the farm was bought by the Rev. William Chafey, Master of Sidney Sussex College, Cambridge, who is reputed to have bought the farm at a sale in London without ever having seen the property. The farm later passed to his grandson, the Rev. W. K. Chafey, who became Rector of Rous Lench in 1881. Joseph and Mary Bomford had five children: Katherine, John, Christopher, Jean and Nicholas. Nicholas took over the running of the farm after his father died until it was sold in 1977. The next occupant was a Mr. Hicks who, after four years, was followed by the present owner Mr. Caspar Tiarks. 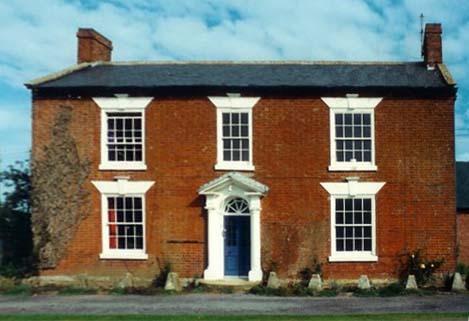 Christopher Bomford, born 1911, lived at the Manor House and later moved to Atch Lench. He married twice. 1. Lilli Heimer, from Sweden, who died and is buried at Atch Lench. 2. Pam Elizabeth Agate, who was a widow with two daughters, Charlotte and Harriet by her first marriage. Christopher deserves a very special mention as it is he who has kept safe the family tree and it may be seen on his drawing room wall, extending for some 13 feet in length. He has supplied copies to Bomford all round the world and visitors from all parts have sought his help in tracing their origins. He also has in safe keeping many articles of interest connected with the family, including written records, medals, a sampler, photographs and so on. Even a short history such as this would have been impossible, had it not been for his care in up-dating family records. He is now resident in Childswickham and represents the main custodian of the historical evidence relating to the family.